Dutra Asphalt Plant will have "A Significant Impact on Highway Operations"
“The project would add trips to congested segments of southbound Highway 101 during the AM peak hour, which is a potentially significant impact. The project could potentially add traffic to northbound Highway 101 during the PM peak hour where traffic has been observed to break down which is also a potentially significant impact. The project would add traffic to the congested southbound ramps during the AM peak hour where operation would be LOS F without project traffic. This is a potentially significant impact. Sebastopol, Santa Rosa, Healdsburg and Cloverdale have all joined Petaluma and stood up against the Sonoma County Supervisors tentative approval of the Dutra Group's proposed asphalt plant next to Shollenberger Park. "decisions made by the elected bodies of the cities within the County with regard to issues within their respective spheres of influence or urban growth boundaries should be respected by the County." Encourage the rest of Sonoma County to follow their lead! 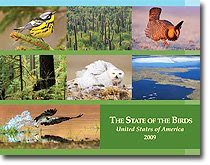 Just Released: State of Birds in the U.S.
North America's bird populations have declined significantly in the past 40 years as bulldozers have flattened forests, rolled over grasslands and filled wetlands. Salazar goes on to point out "In 2009 it is time for a new beginning on how to make sure wildlife and habitat are protected." Don't let Shollenberger Park's incredible array of wildlife and bird species become a statistic at the hands of toxic industry. Have you received a mailer touting why Petaluma needs an asphalt plant? How about a phone survey asking what your stance is on the issue? Perhaps you’ve stumbled upon a slick website making claims about environmental benefits of asphalt production. Environmental benefits of asphalt production?? Nice try but the people cannot be fooled that easily. The concerns of the Petaluma community have begun to resonate throughout the entire County and Dutra knows it. In an attempt to cut through some of the spin, we have compiled 15 reasons why this is the Wrong Plant in the Wrong Place. We’ve supported our responses with quotes from experts and community leaders as well as verbiage pulled directly from Dutra’s own Environmental Impact Report. Click here for 15 reasons why this asphalt plant is bad for Petaluma. Want to help us combat this well funded spin campaign? Donate here. Each and every dollar donated will go toward raising community awareness and funding the legal battle. 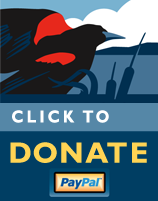 Your donation is tax deductible. In an ironic development, our local newspaper has published an editorial claiming that opponents to the proposed Dutra asphalt plant are “fear-mongers” and “misinformed.” Anyone that has visited this site knows that one thing we don’t lack is information. Over the past several months, the entire community has been remarkable in its ability to research the issues and produce a wealth of documentation and evidence supporting our claim that this is the wrong plant in the wrong place. Are we emotional? Absolutely. The County is trying to force the City to allow the construction of an asphalt plant next to one of our most treasured recreational and environmental resources. Not to mention, the company being force-fed to us has a history of compliance issues and regulatory violations. We think a little emotion is appropriate in this case. While the editorial itself is long on hyperbole, it presented no factual information whatsoever and did not mention the plants impact to Shollenberger wildlife at all. We understand that dwindling readership for traditional print media has newspapers scrambling to sell papers, so who knows what the motivation was here but shouldn’t we expect more from our local media? Please continue to let your voice be heard. If you disagreed with the Argus Courier's editorial please email the newspaper. All of us who subscribe to the Argus, buy it at the newsstand, or read the it on-line...we are their customers; let our opinion of this insulting and inaccurate editorial be heard. Claim: The proposed plant has gone through extensive environmental review. We disagree. And here are 239 pages detailing why (download with caution; it’s a very large file). In addition, many experts continue to step forward claiming the EIR was inadequate. Claim: Asphalt is not a toxic environmental hazard. "Asphalt processing and asphalt roofing manufacturing facilities are major sources of hazardous air pollutants such as formaldehyde, hexane, phenol, polycyclic organic matter, and toluene. Exposure to these air toxics may cause cancer, central nervous system problems, liver damage, respiratory problems and skin irritation." Claim: Dutra has operated with few complaints and there will be established conditions placed on Dutra to ensure proper and safe operation. Finally, the editorial attempts to sling mud at Mayor Torliatt while glorifying Supervisor Kerns. Those claims are so far off base that there is no need to even address them. However, regarding the implication that Petaluma’s Mayor, Pam Torliatt is looking to replace Mike Kerns in the next election, we say: What a welcome change that would be. The Petaluma Health Care District Presents a Community Health Forum for public information and education regarding Health Impacts of the proposed Dutra Asphalt Plant in Southern Sonoma County. As your community public health agency, the Health Care District invites you to attend this important meeting and listen to a panel of experts speak specifically on the potential health impacts of the proposed asphalt plant along the Petaluma River. Shollenberger Park Docents Len Nelson and Bob Dyer caught site of a nesting Great Blue Heron in the Shollenberger heron & egret colony this morning. Please take the time to visit Shollenberger Park and see this remarkable bird firsthand. The best location to view the colony is in the Park from the River Pier (bring binoculars). Please be sure not to approach the colony from Haystack Landing, however, as this colony is now protected against disturbance by the Migratory Bird Treaty Act. Despite Dutra's claim that they will do all they can to “preserve the colony site”, expert testimony has stated that abandonment is extremely likely if an asphalt plant is allowed to be built at Haystack Landing. Please help us protect this colony and all the wildlife in Shollenberger Park. The San Francisco Chronicle and the Greenbelt Alliance have teamed up to spotlight the 5 best "Urban Outings" in the Bay Area. Guess who they selected as their #1 location in the North Bay? Yours Truly! 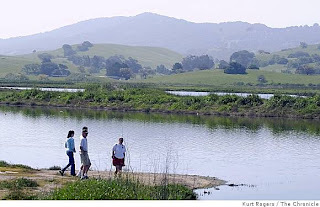 The article states that Shollenberger Park is a "wetland and a 2.1-mile levee walk offering views of rolling hills and the Petaluma River"... adding "Bring binoculars; birders have spotted more than 150 species at Shollenberger Park." If we allow an Asphalt Plant to be built directly across the river from Shollenberger Park, do you think any major publication will be spotlighting us as an environmental destination? Please help us stop this proposal from the Dutra Group. This is the wrong plant in the wrong place. Dine Out Fundraiser at Velascos Mexican, North of the Border Restaurant. Come dine with us anytime during the hours of 11am and 9pm and Velascos will donate 15% of the proceeds to our effort to save Shollenberger Park and stop the Asphalt at Haystack Landing. Mention "Moms for Clean Air"
Thanks to the Moms for Clean Air for organizing this fundraiser! 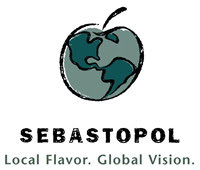 Sebastopol Votes to Support Us! The Sebastopol City Council voted this evening to send a letter of support for the City of Petaluma’s stand on the Dutra Asphalt Plant to all Sonoma County cities and to the County of Sonoma. This letter expresses Sebastopol's position that decisions made by the elected bodies of the cities within the County with regard to issues within their respective spheres of influence or urban growth boundaries be respected by the County of Sonoma. Please forward any and all letters and emails of support to Sebastopol Mayor Sarah Gurney. The Friends of Shollenberger Park and Petaluma's Clean Air applaud Sebastopol’s courage to stand up for the best interest of local community and look forward to the response from other Sonoma County cities. The continuance is requested to allow time to evaluate potential additional noise mitigation measures. Dutra expects this evaluation can be completed within three weeks. Accordingly, Dutra respectfully requests that the matter be continued to the hearing of the Planning Commission schedule for April 2, 2009. Thanks to everyone for their emails, letters and phone calls...it is obvious that we have Dutra's, and more importantly the County's, attention!